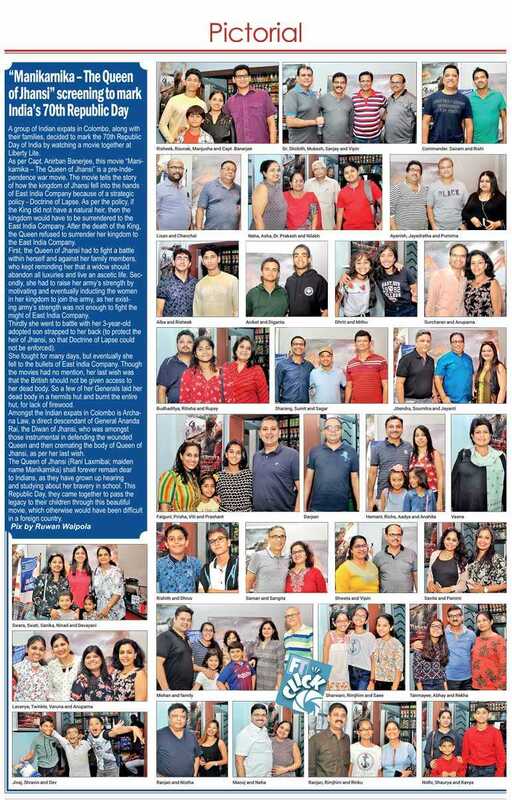 A group of Indian expats in Colombo, along with their families, decided to mark the 70th Republic Day of India by watching a movie together at Liberty Lite. As per Capt. Anirban Banerjee, this movie “Manikarnika – The Queen of Jhansi” is a pre-Independence war movie. The movie tells the story of how the kingdom of Jhansi fell into the hands of East India Company because of a strategic policy - Doctrine of Lapse. As per the policy, if the King did not have a natural heir, then the kingdom would have to be surrendered to the East India Company. After the death of the King, the Queen refused to surrender her kingdom to the East India Company. First, the Queen of Jhansi had to fight a battle within herself and against her family members, who kept reminding her that a widow should abandon all luxuries and live an ascetic life. Secondly, she had to raise her army’s strength by motivating and eventually inducting the women in her kingdom to join the army, as her existing army’s strength was not enough to fight the might of East India Company. Thirdly she went to battle with her 3-year-old adopted son strapped to her back (to protect the heir of Jhansi, so that Doctrine of Lapse could not be enforced). She fought for many days, but eventually she fell to the bullets of East India Company. Though the movies had no mention, her last wish was that the British should not be given access to her dead body. So a few of her Generals laid her dead body in a hermits hut and burnt the entire hut, for lack of firewood. Amongst the Indian expats in Colombo is Archana Law, a direct descendant of General Ananda Rai, the Diwan of Jhansi, who was amongst those instrumental in defending the wounded Queen and then cremating the body of Queen of Jhansi, as per her last wish. The Queen of Jhansi (Rani Laxmibai; maiden name Manikarnika) shall forever remain dear to Indians, as they have grown up hearing and studying about her bravery in school. This Republic Day, they came together to pass the legacy to their children through this beautiful movie, which otherwise would have been difficult in a foreign country.